The visit of Xi Jinping to Moscow—the first foreign tour of the Chinese president—may have brought Moscow and Beijing closer to signing a long awaited agreement on deliveries of Russian gas to China. By the terms of the Memorandum of Understanding (MoU) of 2006, the two countries provisionally agreed on a 68 billion cubic meters (bcm/y) trade deal through both an ‘Eastern’ and a ‘Western route’. Since 2006, the two sides had been negotiating grand trade volumes, but, given that their views on the pricing formula diverged, a conclusive deal was never inked. However, on Friday 22 March, Presidents Xi and Putin signed a memorandum for annual deliveries of 38bcm/y starting in 2018. Once more, Gazprom is hoping that a final compromise on prices will be found within the next few months and optimism has been displayed in this regard. Is this time for real? From a merely economical point of view, this would mean that Gazprom is considering making great concessions to its Chinese counterpart, as it would drop any pretense to the equal profitability principle with the European markets. Hence, were the deal to be inked, one may come to the conclusion that political considerations of Gazprom’s major stakeholder—the Kremlin— carried significant weight during the dialogue, so much that a final agreement may be reached without the wholehearted conviction of Russia’s gas major, to say the least. Sure enough, a major gas trade deal with China would represent a landmark in Russia’s Eastern Gas Program, as well as in her economic history. Since 2006, Gazprom and CNPC had been involved in inconclusive negotiations, which were hindered mainly by disagreements on three main issues—the pricing mechanism, the route of the first pipeline and the access to upstream assets. For her part, Gazprom had been supporting the only project it could achieve relatively cheaply and easily, i.e. to supply Western China with 30bcm/y through the ‘Altai pipeline’ while taping gas reserves directly from West Siberian fields, the same sources for deliveries to the European markets. Russia was aiming to play China against Europe by creating arbitrage potential. However, planners in Beijing never felt the urgency for supplying the Western part of the country with Russian gas, as the region is scarcely populated and industrialized, as well as because it enjoys the geostrategic advantage of being located in proximity of Central Asia’s well-endowed, landlocked countries. Instead, Chinese negotiators long favored an Eastern route, which would involve the sourcing of gas from East Siberian fields and delivering it to the energy thirsty Pacific coast. Furthermore, the high netback oil-linked prices offered by the Russian counterpart—that is to say ‘European prices’—would not satisfy the Chinese, who would rather have pegged gas prices to cheaper coal. As a result, they remained separated by a wide divergence between price preferences—$200-250 per 1,000 cubic meters versus $350-400, or $2.8/ MMBtu at the minimum. A third non-negligible obstacle for the deal to be inked was the unwillingness of Gazprom to allow its Chinese counterpart access to upstream equity—a model CNPC and Sinopec have followed throughout the world. In this respect, Turkmen competitors have proven to be far more accommodating, so much so that the development and construction of the Central Asian gas pipeline was completed in a mere 24 months, as Chinese capital was conditional on a prominent role in the development of its upstream assets. It is no surprise that Turkmen gas is already feeding China’s backbone import infrastructure, the West-East pipeline, with incremental volumes of gas. Gazprom’s sit-and-wait strategy did not bear fruit thus far. It thought it could eventually export both West and East Siberian gas through both proposed routes, thus continuing to dictate prices and volumes to Asian markets, as it long did in Europe. Today it is bitterly discovering that we are living in a buyers’ market, one of growing and increasingly diversified supplies. Before assessing Russia’s upstream options for supplying the Chinese market, it is worth briefly illustrating some of its features. It should be noted in passing, although it is oft neglected, that South East Asia is growing as yet another LNG-consuming region, one that may become vital for the very success of Russia’s Eastern Gas Program. Whereas, quite typically, observers focus on the triad China, Japan and Korea as the main targets of Russian deliveries to the east, it is the Asian continent— mainly Asia-Pacific and Southern Asia—that is driving world gas demand up. Asia’s LNG demand will account for 80% of the world’s demand growth through 2035, while her gas demand should surpass that of Europe in 2035 (29% vs. 28% of global gas demand outlook). In Russia’s circles the refrain often goes: “Asia-Pacific markets mean much a bigger pie than just China”. This is—quite obviously—true, as Japan and South Korea figure as first and second among world gas LNG importers respectively. And for the years following the Fukushima disaster, it seemed that Japan gas demand would skyrocket, although the current Japanese government declared it would seek to reverse the commitments to phaseout nuclear power generation. Nevertheless, the Eastern Gas Program’s first target is clearly the Chinese market, for it is the only one capable of absorbing most of the huge volumes that Gazprom will need to bring to the markets, as they will necessarily try to achieve economies of scale. China’s energy demand is on the rise and gas is becoming increasingly important. Even though it is relatively expensive with respect to coal, its share of total energy consumption has grown steadily in the last 20 years. True, in the short- to medium-term gas would never win a straight competition on cost compared to coal. However, the latter resource is no longer as inexpensive as it used to be, for cheaper alternative fuels have appeared and China has become a net importer of coal. Most importantly, China’s environmental policy has taken a more decisive turn in the direction of reducing air pollution in big cities, thus aiming at curbing coal demand whereas natural gas offers part of a solution. In 2010, gas accounted for a mere 4.3% of China’s energy mix, but according to the 12th Five Year Plan it was targeted to reach 8.3% in 2015 (260bcm), it is to say double the country’s primary energy consumption of 2011. Projections of China’s future demand for 2030 vary within the range of 390bcm (baseline gas balance) and 500bcm (maximum gas balance). Sure enough, it is a market where any relevant gas producer will want to find himself in a comfortable position within the next decade, as it may account for up to a third of global gas demand growth between 2012 and 2030, according to CNPC’s estimates. Mostly LNG and domestic production—both conventional and unconventional—will cover the demand. Sinopec and CNPC sources have argued that the future increases in domestic shale gas production—to be expected in the range of 50 to 150bcm by 2030—will not negatively affect gas imports. Rather, they will increase gas consumption tout court, for that gas will still be sold under regulated prices. Consequently, incremental Chinese shale gas production may even increase the level of imports by an additional 10bcm. Now comes the key piece of the puzzle—existing contracts and domestic production should cover the demand until 2020-25, when a niche of 26bcm should open up, gradually expanding thereafter to a level of 66bcm in 2030. 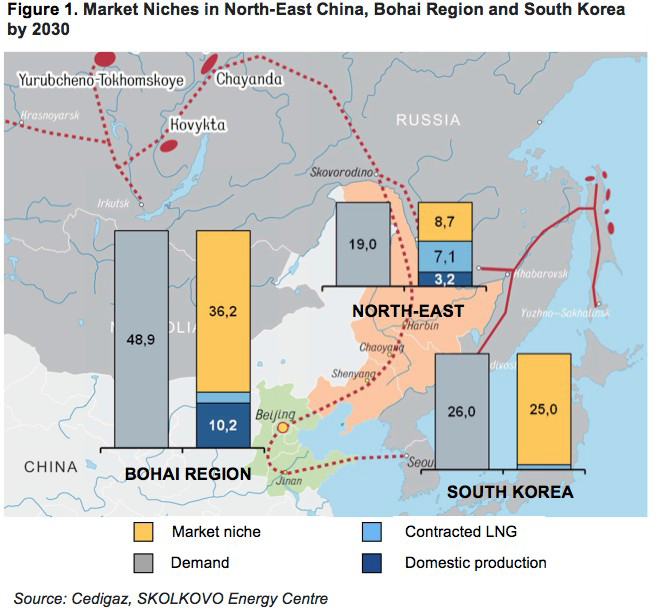 The most interesting regions for Russian gas are the North East and the Bohai (Beijing), which should have respectively 8.7bcm and 36.2bcm of market niche available. Russia will face increasing competition to fill these gaps. Central Asian producers may maintain the upper hand on the Western regions of the country, thanks to their pipeline connections. Little or no contracted space is there to be found. LNG suppliers, on the other hand, are lining up to supply the most appealing and energy hungry markets of the coast belt, where landed prices have surpassed those of Western Europe and almost match those of Japan and South Korea. In addition to the incremental volumes deriving from today’s main suppliers—Australia and Persian Gulf countries—starting from 2018, new fierce competition is expected from Mozambique and East Africa, Canada and perhaps from the US—although we maintain that, if available, such American volumes would probably be directed to Japan and South Korea in first place. Myanmar will have little part of the cake too, as the Sino-Burmese pipeline will start delivering to Southern China 10bcm/y by May 2013. To understand what may be left for Russian gas is to answer a million dollar question. Beyond economic considerations on prices and cost structure, which we will touch upon further, it is worth recalling that China cannot afford relying excessively on LNG supplies. The heavy dependence on seaborne oil and gas trade is a specter for central military planners in Beijing, for whom the “Malacca Straits dilemma” is tantamount of a codeword for “Seventh Fleet”, the capacity of the US to project power in the Western Pacific being the actual security threat. China might thus be willing to pay a slight premium to secure pipeline supplies, thereby diversifying away from the seaborne routes. Moreover, for as much it had thus far been prone to resort to Central Asian gas supplies and given the uncertainty of the politics of the region, Beijing may in a near future start perceiving Russian piped gas less as a strategic threat but rather yet another valuable source for diversification. Nonetheless, there is a sense that, until now, China has been prioritizing LNG over pipeline supplies. Gazprom has been trying to smoke out China by proposing deals with Japan and South Korea, but Beijing has so far kept a straight face. South Korea, for her part, has a poorly diversified import portfolio, as she accounts for 80% of her gas supplies on LNG from Qatar, Oman and Malaysia. A ‘peace pipeline’ connecting her to Russia via North Korea, the Trans-Korean gas pipeline project, sounds nowadays little more than a fantasy, but LNG deliveries from Sakhalin are an option to contemplate, even more so given that Korean landed prices rank among the world’s highest—provided they will remain this appealing for years to come—and because of Seoul’s urge to overcome the above-mentioned energy security challenges. The other natural exit for a relevant share of LNG export would be the Japanese market. A MoU has been signed at the APEC summit in September 2012 with Japan’s Agency for Natural Resources and Energy. However, Tokyo’s utilities look ever less willing to pay oil-indexed prices for Vladivostok LNG, as they are no longer allowed to pass on their rising operational costs to consumers. Therefore, they are considering the possibility to resorting to coal, but mostly remain hopeful that— someday between 2016 and 2017—they may start importing US LNG from at least one or two of the three LNG export projects they have applied for and which are currently under examination of the American Energy Department. In the meantime, they carry on searching for appealing equity stakes in the US upstream. The Eastern Gas Program is a grand plan to develop and bring online the vast gas endowments of the East Siberian and the Far East regions of Russia. Since the area is underdeveloped, Gazprom will essentially be starting from scratch, thus developing greenfield projects, building the pipelines to connect them to the prospective markets and starting natural gas production. The program is state-run and aims at unleashing the great natural potential of the area and promoting its gasification, whereby bringing socio-economic benefits to the region and improving the country’s balance of payments by expanding into Asia-Pacific markets. Gazprom is officially the ‘Program Execution Coordinator’, while several questions remain about possible discrepancies between the economic logic it should be adopting and the political results it has to deliver on behalf of the state—or yielding to pressures from it. For the flexibility it will provide, Vladivostok LNG is devised to play a key role in Gazprom’s strategy. In essence, the plan is to connect the gas and condensate fields of Chayanda, Kovykta, and other smaller plays, to the existing Sakhalin-Khabarovsk-Vladivostok pipeline by a new dual pipeline system by 2017. Another long pipeline project would connect the East to Tomsk and Russia’s Unified Gas Supply System, therefore completing a gas pipeline equivalent of the ‘Trans-Siberian Railway’—although this section looks hardly realizable in the medium- to long-term. For its part, Vladivostok has been selected for the installation of a new liquefaction terminal, from which Gazprom plans to export 10mt/y (14bcm) by 2020, targeting first and foremost the Japanese market, along with other Asia-Pacific countries. The Chinese market would be supplied mainly by piped gas. The ‘Western route’—the Altai pipeline (30bcm/y)— having thus far been discarded as an option, has led to greater commitment to the ‘Eastern route,’ which would feed into China’s North East with 38bcm/y. Moreover, there are other plans to connect Russia’s upstream to Japan or South Korea by pipeline, although currently these seem hardly workable. By combining several sources of supply, different transit routes and a host of market options Gazprom is excogitating a well-articulated, flexible and scalable program, its strategic tenet being to supply China with a sizable volume, while avoiding falling into a monopsonistic trap, i.e. remaining captive in a relationship with her as a single dominant buyer. Thus, for the flexibility it will provide, Vladivostok LNG is devised to play a key role in Gazprom’s strategy, as it will create much needed swing capacity—although not a remarkable one, such as that which the Altai pipeline would generate. In the best case scenario, by 2020 Gazprom may be able to produce as much as 70bcm/y and export 55bcm/y, both from East Siberian and the Far Eastern fields—the combined output of Kovykta and Chayanda may reach up to 20bcm/y, while Sakhalin I, II and III should be producing at full steam 50bcm/y. Nevertheless, when it comes to Eastern gas production, problems never lay on the volume side, but rather in the economic viability of their extraction and shipment out of those inhospitable areas to far away markets. The CAPEX required is one of huge proportions and it is commonly acknowledged by Russian experts that the cost structure of the projects, particularly of those located on the Asian continent, falls short of being competitive. Cost effectiveness should be pursued rigorously at every stage of the chain, from the development of the field, the building and maintaining of infrastructures, to the gas production. Particular attention should be paid to the costs of the pipelines and the related corruption for, as the ironic quip goes, “Russia is the only country in the world where energy companies consider pipelines profit centers.” That is far from being true, Russia is certainly not the only, but the problem remains. On the other hand, East Siberian fields, particularly Kovykta, hold remarkable amounts of helium. Finding an optimum location for installing the gas processing plant and bringing the byproduct to the world markets will be critical for making Gazprom’s project economically viable. The Russian state, too, will need to play his part, as export taxes will necessarily need to be cut at the minimum. The current 30% duty is perceived as a great hindrance for all of the volumes to be produced in Russia’s farther gas frontiers. Before developing the Eastern Gas Program, Russia will have to secure a market share of such a size as to justify its staggering costs. As previously mentioned, the Chinese market niche is the first and foremost target and would start opening up between 2020 and 2025, by which time market demand should reach a level of 26bcm. In 2030, the gas demand gap should grow as high as 66bcm. On the supply side, by 2020 Gazprom should have developed an export capacity of 15bcm/y from continental fields (Kovykta and Chayanda) and 40bcm/y from Sakhalin Island. By 2030, Russia’s Eastern export may reach as high as 68bcm/y in East Siberia and 40bcm/y in Sakhalin (SKOLKOVO Energy Centre, 2012). Hence, Gazprom should still have some room for placing its volumes in the Chinese market. The question will be—how proficiently is it going to compete against the scores of new suppliers mentioned above? Not only do most of them have lower production costs, but also many seem to run faster and are likely to get to the finish line first. 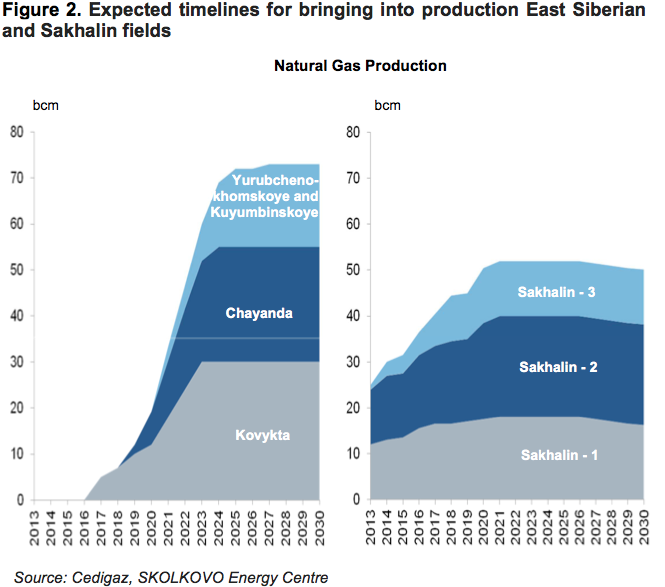 For their part, the Siberian fields are not expected to start production before 2016 (Kovykta) and 2018 (Chayanda), while Sakhalin II is the only LNG project currently online (13bcm/y), Gazprom expects to start production at Sakhalin III in 2014, for about 5bcm/y. As Russia lags behind, the niche will inevitably be shrinking. By 2016-18 new waves of LNG supplies should already be competing on the Asia-Pacific shores and many in Moscow would turn pale facing the prospect of US LNG volumes being dumped in Asia at Henry Hub-indexed prices… And yet, however pessimistic the views of several experts, and however it might seem we are moving in the direction of a buyers’ market plentiful of supplies, Asia’s appetite for natural gas may exceed expectations and the remaining countries, beyond China-Japan-South Korea, might still offer additional attractive market opportunities. An LNG strategy for Russia? Following to the domino effects generated worldwide by the shale gas revolution in the US, Russia finally had to acknowledge the importance of LNG in today’s world. Until recently, Gazprom had been staunchly favoring pipeline projects over seaborne transportation. As Vladimir Drebentsov, an expert of the EU-Russia Gas Advisory Council, puts it, “Gazprom’s strategy has historically focused on two things, developing giant gas fields and exporting this through huge trunk pipelines to external markets. This model has worked quite nicely, till very recently. Being an export monopoly it has not felt any competitive pressure and lived comfortably with that model” (EER, The uncertain future of Gazprom: the moment of truth is approaching, 24 January 2013). While the share of LNG trade was rapidly eroding that of piped gas in the world gas trade (leaping from 22% to 33% in the 2004-2011 period), Gazprom was sitting on few options, namely, the castle in the sky of the Shtokman project, and Sakhalin II—its only LNG terminal, in which development it played an irrelevant role, as it took the lead of the consortium only after the project was completed under the operatorship of Shell. Hence, in mid-February President Putin specifically called for expanding Russian LNG trade, so to seize a larger share than its current mere 3.6% of the global markets. As the Asia-Pacific region is extremely attractive both in terms of volumes and LNG landed prices, it offers Russia the opportunity to emerge from her hibernation. Today, Japan and South Korea display the highest LNG prices globally, but it is worth noting that even China’s pacific coast markets became increasingly appealing, as their prices are already just below those of the two neighboring countries. Furthermore, Beijing is testing the waters to establish more market oriented pricing mechanisms and move away from the prevailing cost plus model—a pilot reform is underway in the two coastal regions of Guangdong and Guangxi. Under the new scheme, prices will be calculated based on the price in Shanghai, which is already linked to international prices of fuel oil and liquefied petroleum gas. Such measures are designed to stimulate both domestic production and imports. The competition in North East Asia grew at such high levels that it stimulated the appetite of a growing number of interested suppliers from the Middle East, Australasia, North America and the promising frontier of East Africa, where recently CNPC purchased from ENI a 20% stake in the richly endowed Rovuma Basin, Mozambique. But even more interesting, it spurred a new export rush among Russian producers, so much so that the two major competitors of Gazprom—Rosneft and Novatek—are now lobbying for putting an end to the gas colossus’ monopoly on exports by seaborne routes. Unlike Gazprom, the two competitors do not rule out the possibility of ceding equity stakes to Asian companies—this is not a little detail for Chinese buyers. Thus, it would not be surprising if in the near future Moscow would yield to their requests and adopt suitable measures to unleash a bigger part of Russia’s huge export potential. On this matter, the views of the White House and the Kremlin may find a point of convergence, provided that the newcomers will not get in the way of Gazprom, which will already be encumbered with its ‘noble cause’—the social-economic duty of developing Eastern Russia. Thus, the tough competition they are scaling-up on the domestic front should not be allowed abroad. The Energy Minister Novak will submit a scheme for a partial liberalization of the gas export within the coming month and President Putin will have the last word. Concerning Novatek, it holds important deposits on the Yamal peninsula and has formed a partnership with Total for an LNG export terminal with a capacity of 16.5 mt/y. North East Asian companies are eyeing closely the possibility for direct involvement, while Novatek has declared that it is expecting to supply Asia and Europe in approximately equal portions. However, Asia-Pacific markets will not be supplied from Yamal on a year-round basis, as the Northern Sea Route is free of ice only two months per year. It is yet to be seen whether Novatek will have free hands for exporting the remaining available volumes in a westward direction. Perhaps it may be allowed to market in the Spanish sector, the only big European market not being supplied by Gazprom. For her part, as a means of diversifying her options, Gazprom has started discussions with Novatek, in view of forming a new partnership to build up integrated capacities in the Yamal Peninsula—the production capability of the LNG terminal would be equal to that of the Novatek-Total project and a final investment decision should be signed by the end of 2013. In mid-February, Gazprom also approved the project of a 15 million mt/year LNG plant to be built near Vladivostok, with the first volumes to be marketable as soon as 2018. To complete the picture, Rosneft is eyeing directly and exclusively the Asia-Pacific, as she intends building an LNG export terminal for her Sakhalin I project in partnership with ExxonMobil. It is noteworthy that Rosneft’s Chairman, Igor Sechin—allegedly the most influential man in Russia’s energy sector after President Putin—advocated only the liberalization of offshore LNG export, a solution which would allow Rosneft to market her volumes directly to Asia, while leaving intact Gazprom’s exclusive right to market Novatek’s Yamal LNG. Needless to say, at such conditions the business would make much less economic sense for the private gas producer. The growing appetite for LNG exports of Novatek and Rosneft poses threats to Gazprom, but allows the Kremlin to amplify its host of strategic opportunities for penetrating the Asia-Pacific markets. As the pipeline by the ‘Eastern route’ remains highly uncertain an option, the deployment of a number of different LNG solutions would provide Moscow with a valuable hedge. The increase of seaborne routes is functional to Russia’s energy strategy as it provides potential diversification of sales markets, particularly on the Pacific Rim. As a matter of fact, today Gazprom is not only dependent on her European customers, but on her pipeline routes as well—a form of transit that provides very little flexibility. To get the facts straight, whatever the skeptics on Russia’s ability to adopt grand strategies may say, Moscow is here pursuing plans at the very grand strategic level. The Eastern Gas Program addresses strictly intertwined long-term goals and combines them with the supreme concept of national security. First, Russia aims at the creation of a new petroleum province to gradually replace the aging West Siberian region—that is to say, she is working on the sustainability of one her most important instrumenta regni. Second, Moscow must pursue a much needed economic and social development in East Siberia and the Far East, in order to offset the outflow of the Russian population. Third, it is seeking to strengthen economic and political integration with the Pacific Rim condominium. Fourth, Russia aims at reviving its relationship with China, thus willing to play the petroleum trade card for a major objective in her foreign relations—we will note it en passant: up till now, Moscow and Beijing have built far stronger ties in crude oil relations than in natural gas. Finally, as a gas producer, Russia needs to diversify export markets and routes. While the Asia-Pacific’s consumption rates are on the rise, Gazprom is still heavily relying on European customers. Furthermore, The loosening of Moscow’s over-dependence on gas exports to Europe—a feature that emerged only in the late years of the Soviet Union—also aims at deviating from a critical historical impasse and taking a more secure and sustainable development path, one that entails more freedom of action in foreign policy, inter alia. When assessing Russia’s strategic performance, a fair critical observation would be that such a momentum lacks of on the very traits of the ideal conduct of strategy—proactiveness. Gazprom could have started consolidating its Eastern front years ago, when times were propitious and Asian consumption rates were already increasing. Instead, it has been sitting on the fence for a decade, never shifting its focus from the Western saturated markets with enough conviction. It has been losing precious time dipping into expensive projects that so far did not bring any significant breakthrough— remember Shtokman? As to the Chinese customers, Russia thought they could afford to wait for her. True, Gazprom had little better to offer than a pipeline connection to West Siberian fields, an option the Chinese side would have hardly accepted so long as Central Asian alternatives would have been available, and sure enough, European customers are still here to pay higher, oil-linked prices. Nevertheless, had Gazprom adopted the spirit of compromise it is forced to display today; had it started reviewing its business model and investment structure earlier, it would have been better off securing market shares in the Asia-Pacific in the long run. To use the metaphor of Aesop’s fable, Gazprom has played thus far the role of the Grasshopper, rather than that of the Ant, and may pay dear consequences, as winter will come. Reorientation towards her Eastern flank has been a recurring feature in history of the last two centuries of Russia’s grand strategies. However such projections of power were justified—be it for border security, commercial expansion, cultural mission, and so forth—these were often of a reactive nature. The idea to move eastwards always hovered as a possible option among Russia’s policy makers, but the decisive urge often emerged at times when these perceived the state of affairs in the European front was not favorable or in stalemate, to say the least. Today, too, the renewed momentum in eastward direction is too clear an indicator that things are going for the worst in Europe—from the Ukraine to the English Channel—and that the prospects are not getting any rosier since the beginning of the crisis in 2008. Gazprom’s natural gas exports to Europe fell by 7.5% year-on-year to 138.8bcm in 2012, a decline that largely owes to the low flexibility of its pricing, more than to the weakness of European demand. Moreover, telling it all, the European gas demand has been stagnating for almost a decade, revealing the structural nature of the problem, one that cannot be reduced merely to the impact of the recent economic downturn. On the other hand, the rapid expansion of gas supply options to the Pacific Rim countries have stepped up the level of competition and are narrowing market niches for Gazprom. The need for a strategy of reorientation eastwards emerges thus as a responsive measure which follows the acknowledgement that the world gas markets are evolving at a fast pace and that investment should be switched accordingly, i.e. prioritizing those made on commercial bases. But reorientation does not look much as the result of Gazprom’s leadership long view. Rather, it seems that Russia’s gas major is running against time and is therefore compelled to adopt an extremely costly and risky ‘plan B’, one it has been pondering only half-heartedly for years, as working in that direction would have involved heavy initial sacrifices. To use the metaphor of Aesop’s fable, Gazprom has played thus far the role of the Grasshopper, rather than that of the Ant, and may pay dear consequences, as winter will come. However tardily, Russia is moving and still has a variety of options for competing for the Asia-Pacific markets, as volumes and possible routes are certainly not missing. In the best case scenario, Gazprom will manage to find a compromise with CNPC, thus yielding to the Chinese request to lower prices. This would most likely mean that production costs and export tariffs will be abated to very minimum level. As previously mentioned, the strategic use of the gas processing plants for marketing the helium associated to Siberian fields will also play a key role in improving the economic rationale of the Eastern Program. On the flanks of the Eastern route pipeline, Russia would deploy a number of LNG export options—Vladivostok, Sakhalin and Yamal—that would forestall the risk of abiding by the rules of China as a monopsonist. In a more sober, down to earth scenario, Gazprom may choose to keep from pursuing her costly projects of Chayanda, Kovykta and the ‘Eastern route’ pipeline and focus on her few LNG options. The Kremlin, in turn, may decide to associate these to other seaborne trade routes under the control of Rosneft and Novatek. It would be better off could it facilitate an arrangement such as to have the three companies playing in unison—not an easy task, in a buyers’ market as that of today. Though, with or without an intra-national competition, would Russia secure three bankable LNG export deals to the Asian shores in the short term, she would arguably be achieving a fair degree of success. Maurizio Recordati is the assistant Director of the ENERPO Program at the European University at St. Petersburg. His interest focuses on the history of Russian Grand Strategies and World Oil and Gas Affairs.